The term woodpecker encompasses many of the species in the family Picidae, a grouping of "near-passerine" birds. Birds in the Picidae family live wild on every continent except Australia, Antarctica and the Arctic. More than 200 species of woodpecker have been identified throughout the world. These birds have adapted to life in a variety of habitats, including temperate forests, rain forests, deserts, grasslands and savannas. Woodpeckers live in every one of the 50 United States, as well as in most of Canada and Mexico. The northern flicker (Colaptes auratus) can be found in forests throughout America, parts of Mexico and all but the most northern reaches of Canada. 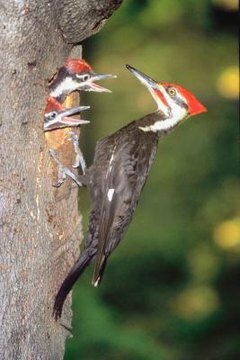 The pileated woodpecker (Dryocopus pileatus) is one of the largest woodpeckers in North America. These birds live in forests and sometimes suburban areas where there are plenty of dead and fallen trees. They're most commonly found in the eastern and northern United States. The gila woodpecker (Melanerpes uropygialis) lives in the deserts of the southwestern United States and Mexico, in the saguaro cactus forests. These woodpeckers excavate holes in cactuses to allow the cactuses to dry out, then they inhabit the cactuses. Gilas can thrive in dry subtropical forests, riparian woodlands and residential areas. Many South American woodpeckers live in deserts and other arid environments. For example, the Ecuadorian piculet (Picumnus sclateri) of Ecuador and Peru lives in deserts near scrub brush and cacti, into which they excavate their nests. The Chilean flicker (Colaptes pitius) is unlike many other woodpeckers because it avoids deep forests and instead prefers open fields, stony hills and forest edges. These birds are found almost exclusively in Chile. Woodpecker species have spread through Europe and Asia. The Syrian woodpecker (Dendrocopos syriacus) lives from northwestern Europe to Iran. These birds live in forests that have significant cover and dead trees in which to build their nests. The Eurasian three-toed woodpecker (Picoides tridactylus) is found from Norway to Korea, even out to Siberia, as well as in Canada. A few woodpecker species are native only to the island of Japan, like the Japanese woodpecker (Picus awokera) and the Okinawa woodpecker (Sapheopipo noguchii). Woodpeckers exist in every clime of Africa. The Mombasa woodpecker (Campethera mombassica) is found only in certain parts of Kenya, Somalia and Tanzania. The bearded (Dendropicos namaquus), golden-tailed (Campethera abingoni), Nubian (Campethera nubica), and cardinal (Dendropicos fuscescens) woodpeckers are common species in Africa. Their habitat includes open woodlands and savanna. The olive (Mesopicos griseocephalus) and Knysna woodpeckers (Campethera notata) live in Africa's temperate forests and moist savannas. The African piculet's (Sasia africana) habitat includes tropical rainforest from West Africa to Uganda. Living Library: Woodpeckers - Knock Knock, Who's There?